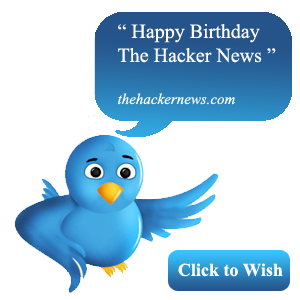 One of the most awaited occasions in a year is your birthday, same way we are today celebrating 'The Hacker News' 2nd Birthday week from on 28th October-3rd November 2012. Originally founded on 1st November 2010 by Mohit Kumar, 'The Hacker News' was the very First dedicated Hacking and Security News website available on Internet, Now been internationally recognized as a leading news source dedicated to promoting awareness for security experts and hackers. We are happy to announce that this project is now Supported and endorsed by thousands of Security Experts, administrators and members of various underground hacking groups and communities worldwide. With the need for information security solutions becoming more critical, In these two years we served updates to over 30 Million Readers through various projects including Daily happenings of Hacking & Security community via The Hacker News, A most comprehensive and informative collection of security, hacking, and innovative technological as The Hacker News (THN) monthly Magazine and A huge archive on Hacking Tools / Security / Penetration Tools collection via 'Tools Yard' and recently founded 'The Hackers Conference" in July 2012 - a unique event, where the elite of the hacker world, leaders in the information security industry , Law Enforcements and the Internet community meet face to face to join their efforts to cooperate in addressing the most topical issues of the IT world. Message from Fouder's Desk, "I will not say, how much Hi-Fi or Top security Blog we are or I will not count my achievements here .... because our mission is to make the internet more secure, more aware and more reliable and I am happy to share that we @ THN make aware about internet security threats and educate millions of people around the world. We always welcome contributions from readers and hackers like YOU! Stepping into 3rd year of service we have some more new creative projects planned ahead for next year." "I would like to thank a few people who make these two years most remarkable and with their outstanding contribution this become impossible project come true : Ann Smith , Kislay Bhardwaj, Priyanshu Sahay, Pierluigi Paganini, Lee Munson, Mourad Ben Lakhoua, Prabhjot Singh, Jiten Jain, The Complete Anonymous Hactivist Group and none other than ... Myself Unix_Root (Mohit Kumar) :D"